Individuals with Autism Spectrum Disorder often have difficulties with social, emotional and communication skills and tend to find changes in their daily routine difficult. Therefore, taking a plane trip can be very stressful, not to mention difficult for the families of children with ASD and related disorders. Airports have many pressure points where communication is key and stress can run high. Long lines, security screenings, large crowds, loud noises and unfamiliarity with airport personnel can create extreme fear and anxiety for children with ASD and other conditions. 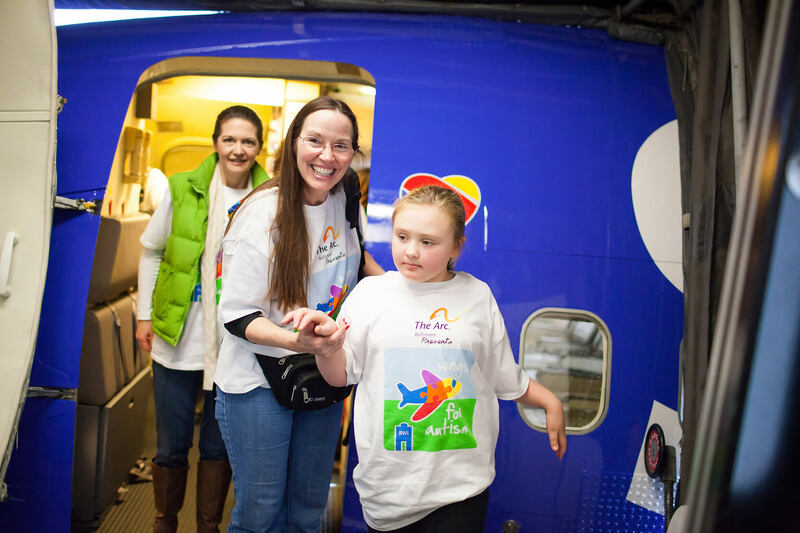 Designed to alleviate some of that stress and panic, Wings for Autism is a program aimed at giving families greater confidence with air travel via a smoother boarding process through preparation skills and practice. It also gives airport, airline, Transportation Security Administration professionals and other personnel the opportunity to observe, interact and deliver their services in a structured learning environment. The Mobile Regional Airport will host its first Wings for Autism Event Feb. 20 at 5:30 p.m. in partnership with American Airlines, Airbus USA and Mobile Airport Authority. Coordinating local Arc chapters Mobile, Baldwin and Clarke counties also will be hosting the event, along with the Autism Society of Alabama. “Events like Wings for Autism help children with ASD by allowing them to experience a new activity in a more controlled environment, while assisting airport staff in learning how to be better prepared to serve families affected by ASD when they travel,” Angel Loewen, community and program coordinator for the Autism Society of Alabama, said. Established by the Charles River Center, an affiliated chapter of The Arc in Boston, Massachusetts, Wings for Autism program was designed as a national initiative to reach more than 20 airports, providing educational methods to help families prepare and practice flying without ever leaving the ground. The flight rehearsal covers everything from checking in, going through TSA security to boarding the plane, as well as taxiing around the airfield, for an authentic flight experience. “The Autism Society of Alabama believes it is so important to have events like these in the community. Not only do we want to bring awareness of autism, we really want to promote acceptance,” Loewen said. According to the Centers for Disease Control, about 1 in 68 children have been identified with autism. It is the fastest growing developmental disability in the U.S.
“This program is a great way for airport employees to learn more awareness of Autism Spectrum Disorders and this will allow them to provide better customer service for everyone and provide a true airport experience for the participating families,” Brian Belcher, marketing director for Mobile Airport Authority, said. According to Belcher, American Airlines has secured two 50-seat CRJ CanadaAir regional jet planes for families to board during the event at Mobile Regional Airport. A reception will take place while participants wait for the mock flight at the gate. The first Wings for Autism event in Alabama was held Sept. 26, 2015, in Birmingham, hosted by The Arc of Jefferson County at Shuttlesworth International Airport. “After an epic amount of positive feedback with the event in Birmingham, Mobile Regional Airport is sure to have a successful, worthwhile event for their families and volunteers,” Caitlin Davis, program assistant for The Arc in Washington, D.C., said. Participants of all ages are welcome and encouraged to attend Wings for Autism with their families. Parents have brought infants to past events, and participants as old as 65 have attended. Siblings of participants also benefit from the program as they learn many feasible ways they can help make a flight easier for their loved ones. Wings for Autism provides an environment for all participants to figure out how to best accommodate their needs. The event is open to any child with a developmental disability who would benefit from the experience. Participants must register in advance. Many of the airports participating in the program have hosted repeat events. As the program grows, new communities continue to join the national initiative, creating more awareness. “This unique opportunity provides the families we serve with an invaluable experience, and we appreciate the efforts on their behalf by all the partners involved in bringing this event to our community,” Amy Odom, Mobile Arc Public Relations and Development Director, said. There is no cost for the Feb. 20 event but it is limited to 100 participants, all of whom must register in advance at www.thearc.org/wingsforautism.